Memphis Slim (Peter Chatman) was a huge, shrewd, imposing blues singer and pianist. Years of hoboing, grinding one-nighters through nearly every part of the country, and the weeks in raucous juke joints had weathered and strengthened Memphis Slim to the point at which he became uncommonly resourceful in the continuing free-for-all that determines oneÕs survival chances in music. He caught the ear of producer Nat Hentoff who brought him into New York to record. 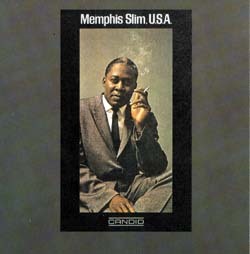 Memphis Slim, U.S.A. is another classic blues title recorded in 1961 and produced by Nat Hentoff for Candid Records. This recording captures the essence of Memphis SlimÕs maturing process. This vital reissue will be promoted properly from the beginning. It has been remastered, reserviced to radio and the press for reviews. The title is appearing in national magazine advertisements for Jazz and Blues enthusiasts such as Downbeat, Jazziz, Jazztimes and The Living Blues.